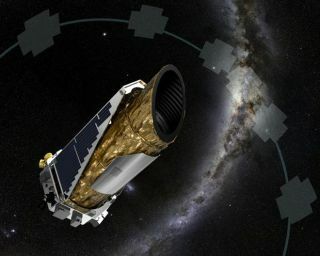 Artist's illustration of NASA's Kepler space telescope, which observed that the star KIC 8462852 dimmed dramatically numerous times between 2009 and 2013. The mystery behind a strangely dimming star could soon be solved. Astronomers around the world are keeping a close eye on the star KIC 8462852, which has dimmed dramatically numerous times over the past few years, dropping in brightness by up to 22 percent. These big dips have spurred speculation that the star may be surrounded by some type of alien megastructure — a hypothesis that will be put to the test if and when KIC 8462852 dims again. KIC 8462852 is a large star that lies about 1,500 light-years from Earth. The dimming events, which were observed by NASA's Kepler space telescope between 2009 and 2013, seem too substantial to be caused by an orbiting planet, many astronomers say. Another plausible explanation — a planet-forming disk — doesn't seem to make sense, either, because KIC 8462852 appears to be a mature star whose planets (if it has any) have already formed. So scientists are entertaining a number of other ideas, hypothesizing that the dimming might be caused by a swarm of exocomets or perhaps even some type of orbiting alien megastructure. This latter possibility is unlikely, researchers stress, but it's still worth checking out. Indeed, astronomers have aimed radio telescopes at KIC 8462852 to search for signals that may have been generated by intelligent aliens. And follow-up is proceeding on other fronts as well. A number of optical telescopes are watching the star, waiting for another multiday dimming event to take place. Once such an event begins, large scopes outfitted with spectrographs will swing into action, studying and monitoring the various wavelengths of light emanating from KIC 8462852, Wright said. "That'll tell us what that material is that the starlight is being filtered through," he said. "It'll tell us if maybe we're looking at ordinary astrophysical dust; it'll tell us if we're looking at gas." "If we see any color dependence in the dimming — if it gets dimmer in the ultraviolet than it does in the infrared, for instance — then that would rule out that whatever we're looking at is a solid object," Wright added. Wright thinks the data will eventually show that KIC 8462852's dimming events are caused by dust. If that turns out to be the case, it would raise another mystery for astronomers to solve — namely, where all that dust is coming from. Is it being shed by exocomets, for example, or is the material trapped in a giant ring system around a Saturn-like alien planet? "The amount of dimming we get tells us something about the size of the dust — is it as fine as smoke, or is it pebbles and things?" Wright said. "That'll help us figure out which of those scenarios we're looking at."